The Place Vendôme’s oldest jewellery house is celebrating its 160th anniversary this year and to celebrate, unveiled its new high jewellery pieces as part of an interactive exhibition called Vendôrama at the Monnaie de Paris. 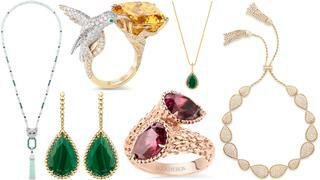 Highlights include new additions to the house’s signature Serpent Bohème collection in diamond, malachite and rhodolite as well as a number of animal-inspired unique pieces including a diamond wolf necklace and hummingbird ring set with an impressive yellow beryl (pictured). As is tradition, Chanel’s fine jewellers took inspiration from an enduring symbol of Gabrielle Chanel’s life for its latest high jewellery collection. Emblematic of Venice – a city which held great importance to Gabrielle Chanel who was also born under the Leo zodiac sign - lions were a constant motif in her work and have been reprised once again for the L’Esprit du Lion collection. Comprised of 53 pieces, including fine jewellery watches and a table clock, the symbol of the lion has been combined with another great emblem of the house – chains – on necklaces, open bracelets, chokers, brooches and earrings in diamond, sapphires, beryls and imperial topazes. The final instalment in a trio of high jewellery collections taking inspiration from the Palace of Versailles, after exploring Versailles at night and the palace gardens, creative director Victoire de Castellane this time turned her attention to the secrets held within its walls. Recalling antique jewels, the collection features mechanical pieces designed to reveal and conceal hidden surprises at their wearers whim. Lockets and rings slide to reveal tiny sculpted vanities, pear-shaped stones spring open to uncover a diamond watch face and vibrant gems are unearthed from beneath intricately set brooches in a cacophony of sparkle and glamour that perfectly embodies the exuberance of Versailles. 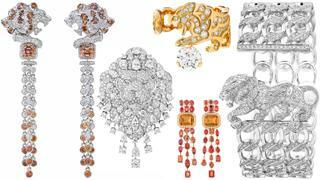 Chaumet presented the first edition of its Les Mondes de Chaumet collection in January with two further ranges expected in June and July aimed at updating the house’s signature pieces for a modern wearer. The first instalment - Promenade Impériales – takes its cues from the icy landscapes of winter in Russia and the ornate aesthetic of Doctor Zhivago. A lace-like diamond snowflake motif runs throughout the collection on rings, earrings, brooches, necklaces and bracelets with the purity of the white diamonds highlighted by blue Ceylon sapphires and pink Padparadscha sapphires. 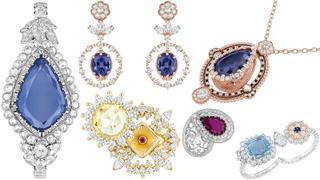 Pictured: Brooch in white gold with cushion-cut sapphire and marquise and brilliant-cut diamonds; earrings in white gold with oval-cut sapphires and marquise and brilliant-cut diamonds; bracelet in white and pink gold set with oval-cut Padparadscha sapphire and marquise-cut and brilliant-cut diamonds; ring in white and pink gold with a cushion-cut ‘sunset’ Padparadscha and marquise and brilliant-cut diamonds; ring in white gold with oval, marquise and brilliant-cut diamonds; ring in white gold with an oval-cut sapphire and marquise and brilliant-cut diamonds; Earrings in white gold with marquise and brilliant-cut diamonds; transformable necklace in white and pink gold with a pear-shaped ‘sunset’ Padparadscha sapphire, a cabochon-cut Padparadscha sapphire and marquise and brilliant-cut diamonds. Chaumet presented the first edition of its Les Mondes de Chaumet collection in January with two further ranges expected in June and July aimed at updating the house’s signature pieces for a modern wearer. The first instalment - Promenade Impériales – takes its cues from the icy landscapes of winter in Russia and the ornate aesthetic of Doctor Zhivago. A lace-like diamond snowflake motif runs throughout the collection on rings, earrings, brooches, necklaces and bracelets with the purity of the white diamonds highlighted by blue Ceylon sapphires and pink Padparadscha sapphires. 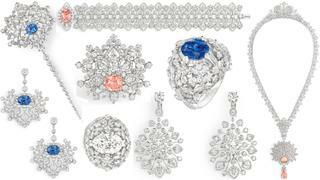 Pictured: Brooch in white gold with cushion-cut sapphire and marquise and brilliant-cut diamonds; earrings in white gold with oval-cut sapphires and marquise and brilliant-cut diamonds; bracelet in white and pink gold set with oval-cut Padparadscha sapphire and marquise-cut and brilliant-cut diamonds; ring in white and pink gold with a cushion-cut ‘sunset’ Padparadscha and marquise and brilliant-cut diamonds; ring in white gold with oval, marquise and brilliant-cut diamonds; ring in white gold with an oval-cut sapphire and marquise and brilliant-cut diamonds; Earrings in white gold with marquise and brilliant-cut diamonds; transformable necklace in white and pink gold with a pear-shaped ‘sunset’ Padparadscha sapphire, a cabochon-cut Padparadscha sapphire and marquise and brilliant-cut diamonds. Van Cleef & Arpels began unveiling its new high jewellery collection at the SIHH 2018 watch fair in early January and, accordingly, the new nature-inspired collection puts great focus on high jewellery timepieces. Following on from last season’s Le Secret collection of transformable jewellery, many of the Van Cleef & Arpel’s new pieces take the form of ‘secret’ watches that initially resemble gorgeous gem-set bracelets before a piece moves to reveal the watch’s face. 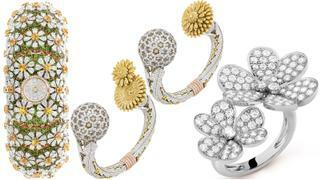 Other designs, such as the Paquerette watch (far left) demonstrate the house’s inimitable savoir-faire while a selection of white diamond floral pieces offer timeless designs to treasure for generations.